Samsung has tasted massive success with its latest Galaxy S10 series phones. The S10, S10E, and the larger S10 Plus are flying off the shelves. Just days after the unveiling of Galaxy S10 handsets, Sony unveiled its own Xperia 1 smartphone to take on the S10 and other phones in the premium segment. Here we take a detailed look at the Galaxy S10 Plus vs Sony Xperia 1 comparison to help you decide which phone is a better buy for you. The Xperia 1 could be the last flagship in Sony’s Xperia line. The Japanese company has dropped hints that it could launch future phones under new branding. Sony is also cutting about 2,000 jobs as its smartphone business continues to struggle. Only time will tell whether the Sony Xperia 1 would turn out to be a game-changer. But there is no denying that it has a gorgeous display and powerful hardware. 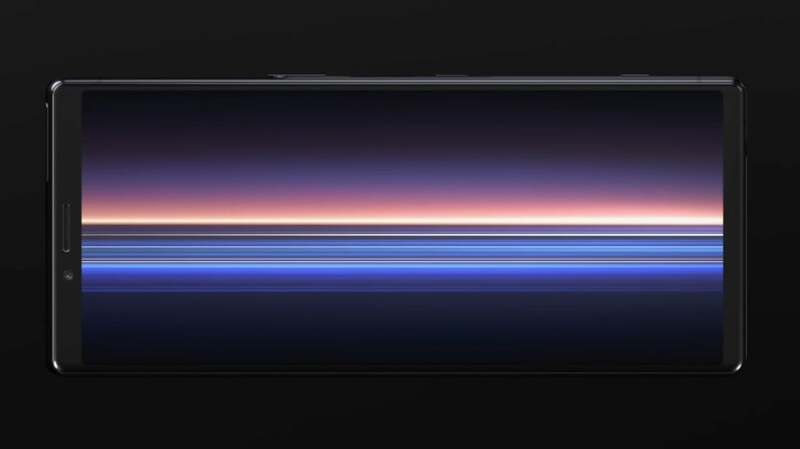 The Galaxy S10 Plus has stayed away from the display notch in favor of a hole-punch Infinity-O display that expands the usable screen area. There are two holes in the top-right corner to house the selfie cameras. The phone has a curved display and a nearly bezel-less design. The S10 Plus retains the 3.5mm headphone jack. It measures 157.6×74.1×7.8 mm and weighs 175g. The phone is available in Prism White, Prism Black, Prism Blue, Ceramic Black, and Ceramic White colors. Unlike S10 Plus, the Xperia 1 has thick bezels at the top and bottom. There is no notch or hole-punch design. It has done away with the 3.5mm headphone jack. The phone measures 167 x 72 x 8.2 mm and weighs 180g, which means it’s longer, thicker, and heavier than the S10 Plus. It comes in Black, Gray, Purple, and White colors. The front and rear glass panels are protected by Corning’s Gorilla Glass 6. Both the handsets come with an IP68 rating for water- and dust-resistance. They can remain submerged in up to 1.5 meters deep water for up to 30 minutes. For authentication and security, Samsung has used an in-display ultrasonic fingerprint sensor on its phone. It lets you unlock the device by placing your finger on the screen. In contrast, the Xperia 1 has opted for a side-mounted fingerprint sensor integrated into the power button. When it comes to the OLED display technology, no vendor is as good as Samsung. The S10 Plus sports a gorgeous 6.4-inch Dynamic AMOLED Infinity-O display with a resolution of 3,040×1,440 pixels. The Always-on display provides HDR10+ support and is protected by Corning’s Gorilla Glass 6. It has a 19:9 aspect ratio, 88.9% screen-to-body ratio, and 522ppi of pixel density. Sony has also done an excellent job with the Xperia 1 display. The phone sports an ultra-tall 6.5-inch CinemaWide OLED display. It has a 4K resolution of 1644 x 3840 pixels, an 82.0% screen-to-body ratio, and 643ppi pixel density. The 4K display supports HDR technology for enhanced video experience. The S10 Plus is equipped with Qualcomm’s Snapdragon 855 or Samsung’s in-house Exynos 9820 processor depending on the market. The US version runs the Snapdragon 855. It comes in two RAM and three storage options. There is an 8GB RAM/ 128GB storage option, an 8GB RAM/ 512GB variant, and a 12GB RAM/1TB storage model. It also has a microSD card slot that supports up to 512GB of external storage. Sony Xperia 1 also runs the latest Qualcomm Snapdragon 855 processor with Adreno 640 GPU, same as the US variant of Galaxy S10 Plus. However, it has a slightly lower 6GB RAM. The Xperia 1 comes in 64GB and 128GB of storage options. It also supports 512GB of external memory via a microSD card slot. In terms of software, both phones run Android 9 Pie out of the box. However, the S10 Plus gets Samsung’s custom One UI skin, which is designed to offer an intuitive experience on phones with larger displays. It displays content in the top half of the screen and navigation options near the bottom to ensure that they are within the reach of your thumb. The Galaxy S10 Plus packs a 4,100mAh battery with fast charging, fast wireless charging, and Wireless PowerShare charging technologies. You could use your S10 Plus to charge other compatible devices and accessories by placing them on the back of S10 Plus. The battery is large enough to get you through a full day of normal-to-heavy usage. The Xperia 1 gets a decent 3330mAh battery with 18W Xperia Adaptive Charging. It doesn’t support Wireless PowerShare, but gets Smart Stamina and Stamina mode. According to DxOMark, the Galaxy S10 Plus is among the world’s best smartphone cameras. It features triple cameras on the rear panel and dual cameras on the front. The rear camera setup consists of a 12MP wide-angle lens, a 12MP telephoto lens, and a 16MP ultra wide-angle lens. For selfies, it uses a combination of a 10MP wide-angle sensor and an 8MP depth sensor. It delivers excellent results, even in low-light conditions. On the other hand, the Xperia 1 also gets triple cameras on the back. It consists of a 12MP wide-angle lens, a 12MP telephoto lens, and a 12MP ultra wide-angle sensor. 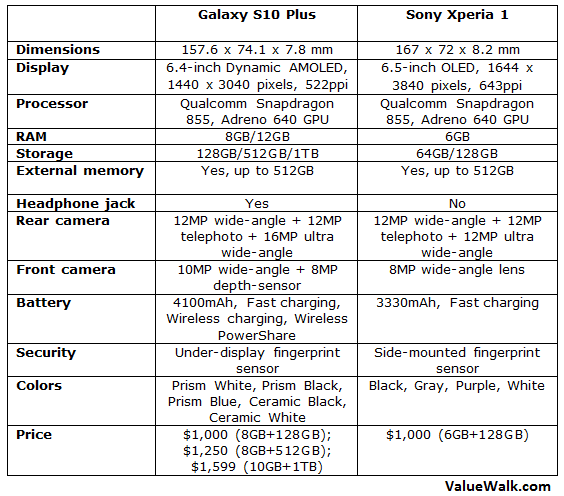 The rear cameras look promising on the paper, but Sony isn’t known for making the world’s best smartphone cameras. On the front, it gets an 8MP selfie camera with f/2.0 aperture. Both the S10 Plus and Xperia 1 are premium smartphones with high price tags. The S10 Plus has been priced at $1,000 for the 128GB storage variant, $1,250 for the 512GB model, and $1,599 for the 1TB storage option. The Sony Xperia 1 lacks many of the S10 Plus features such as dual selfie cameras, a larger battery, a higher RAM, and Wireless PowerShare technology. But it matches the S10 Plus in terms of pricing. The Xperia 1 is up for pre-order on Amazon for a staggering $1,000 for the 6GB RAM/128GB model.